A number of students, party activists, people from the trade and business fraternity also met Rahul Gandhi. 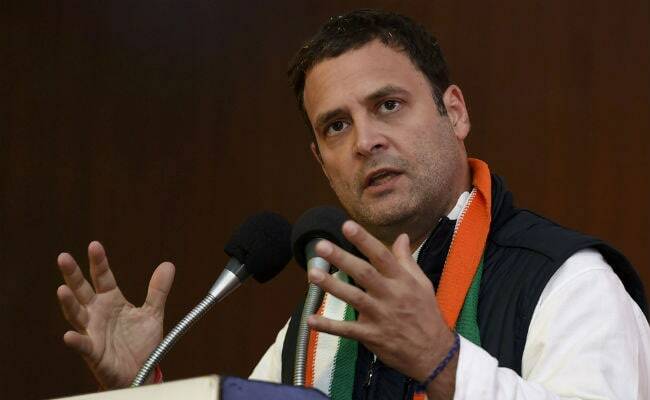 Congress President and Amethi Member of Parliament Rahul Gandhi today held a 'janta darbar' during which he listened to the problems of the people of his constituency. Mr Gandhi, who is on a two-day visit in Amethi, started his second day by meeting people from different walks of life on the premises of the Congress office in Gauriganj -- the district headquarters. Former Union minister and lawmaker Sanjay Singh and his wife Ameeta Singh met the Congress president and discussed with him issues related to the party and the people. "A discussion on how to make the Congress stronger in Uttar Pradesh was held with Rahulji," Mr Singh said. A number of students, party activists, people from the trade and business fraternity also met Mr Gandhi. Sangita Anand, daughter of former Uttar Pradesh minister and senior BJP leader Ram Lakhan Passi, and her husband also met Gandhi. Asked about the meeting, Ms Anand said she was in Amethi to see "my MP and nothing else". Later in the day, Mr Gandhi will visit party leader Baijnath Tiwari, whose wife passed away recently, to offer his condolences. He is also expected to meet former block pramukh of Amethi - Ram Murti Shukla. Mr Gandhi will pay homage to CRPF personnel A Maurya at Naraini village in the Amethi assembly segment. Maurya was martyred during a Naxal attack in Chattisgarh's Sukma district in April. He will also address a gathering of farmers on the premises of Mukutnath Inter College in Tala village on the Amethi-Gauriganj highway.